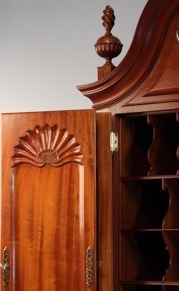 The Rhode Island Desk and Bookcase is one of the most famous pieces of American Furniture associated with the Townsend Goddard family of cabinetmakers of Newport, Rhode Island. There are nine know examples of this style Block and Shell Carved Desk and Bookcase, all of which are in museums around the country except for one which sold at Christies of New York in 1989 to a private buyer for a record $12.1 Million Dollars. This desk and bookcase is going to be a version based on 4 of the 9 known examples. 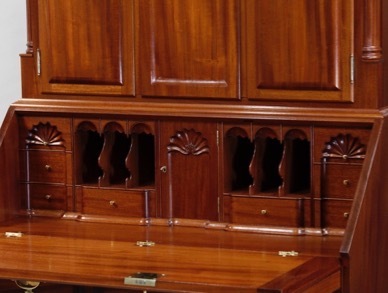 The four original Secretary Desks are attributed to John Goddard and are located at the Rhode Island School of Design, Metropolitan Museum of Art, New York, The Museum of Fine Arts, Houston, and Winterthur Museum, Garden and Library. We will be making this Desk and Bookcase out of solid South American Mahogany using a spectacular plank of figured mahogany for the Drawer Fronts, Lid, door panels and pediment panels. The interior drawer parts will all be made from a single log of tiger maple. The parts will be re-sawn from the larger planks. All Carvings are done by hand and all of the dovetail joinery is hand cut.